Suzuki’s SV650 is a mega bike, in fact it’s just topped the sales charts as Europes’s best selling bike. But Suzuki wants to spread the message even further – so the company has just cut £350 from the price of the SV650S. The faired version is now £4479 instead of £4799. The Rider Bonus scheme will run from May 8 to June 30 and follows the £700 price cut on the GSX-R1000, £600 on the GSX-R750 and £500 on the GSX-R600. 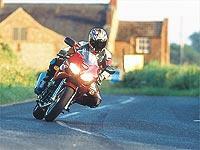 The SV650 took the top spot with 24,738 faired and unfaired models sold in 2001.